After a holiday season filled with cupcakes, Michigan will open Big Ten play this afternoon at Illinois. The Wolverines’ three games against the Illini last season featured the full spectrum of emotions. Michigan won the season-opener in overtime at the Crisler Center in an emotional overtime comeback before Illinois returned the favor with a comeback overtime win that featured a 14-2 beat down in the extra five minutes. The Wolverines got the last laugh in the Big Ten Tournament with a 73-55 blow out win, but both teams will have plenty of motivation to fall back upon after last season. John Groce’s team enters the Big Ten opener on a five game winning streak, including a win over rival Missouri, after losing five of its first eight games to start the season. The Illini have been hit by the injury bug hard and will be without transfer big man Mike Thorne Jr., point guard Tracy Abrams, combo forward LeRon Black and potentially La Salle transfer point guard Khalid Lewis (mumps). Both teams are better on offense than defense this season, but the numbers say the Wolverines should be slightly better on both ends of the floor. The Illinois offense is perimeter-oriented at heart. 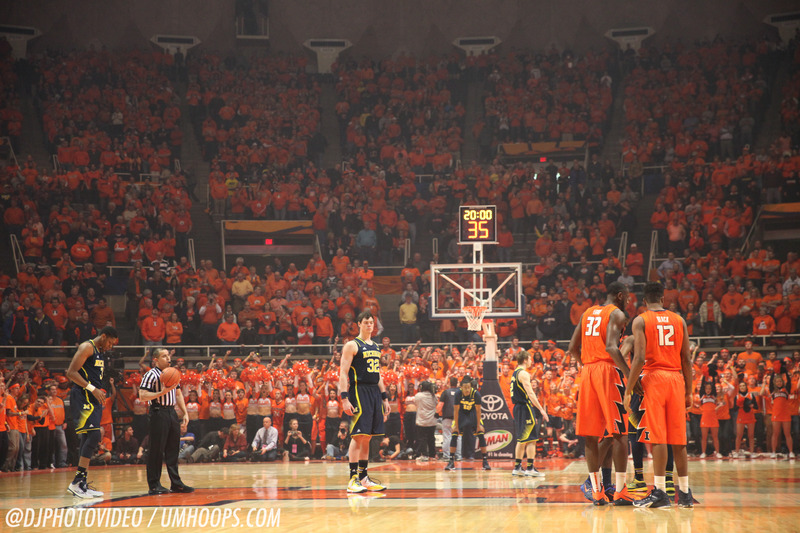 The Illini attempt 37% of their field goal attempts from long distance and shoot 50% on twos and 37% on threes. They give the ball away on just 14.2% of their possessions, best in the Big Ten other than Michigan, and are relative non-factors on the offensive glass (25.2 offensive rebounding rate, 294th) and at the free throw line (32.9 FTA/FGA, 245th). Defensively, Illinois’ resume is a mess. The Illini have the second worst defense in the league, ranked 169th in adjusted defensive efficiency according to KenPom.com. Illinois is that bad defensively despite being a very good defensive rebounding team (26.2% offensive rebounding rate allowed, 53rd) and doing a good job of avoiding fouls (25.8 FTA/FGA, 21st). That’s because opponents just don’t miss very many shots against the Illini. Non-conference foes made 50.9% of their twos (240th) and 39% of their threes (315th) for a 53.9 effective field goal percentage (297th). Those statistics are ugly and Illinois is the only team in the Big Ten that has allowed more points than expected on shot attempts against their defense this year according to Shot Analytics. Illinois will play some zone, on just shy of 20% of its possessions according to Synergy Sports, but I’m not sure if the Illini would utilize the zone against Michigan’s elite zone offense. The Illini grade out in the 28th percentile nationally in half court man defense and 22nd in half court zone defense. Malcolm Hill and Kendrick Nunn are the two leading scorers in the Big Ten and they happen to play for the same team. Together they average 37 points per game and they are very efficient given their offensive volume. Hill, a 6-foot-6 220 pound junior, will likely draw Zak Irvin on defense. He plays the stretch four position, but he’s also one of Illinois’ best creators. Hill shoots 52% on twos and 33% on threes for a 51.2 eFG% and he leads the team in assists per game for good measure. He’s not just the most productive ball screen creator and isolation driver on Illinois’ roster, he’s also the best roll man on the roster. Expect just about every Illini offensive set to have Hill heavily involved, but he’s struggled in his previous five games against Michigan. His career numbers versus the Wolverines are just 10.8 points per game on 36% shooting inside the arc and 38% shooting outside. Kendrick Nunn missed the first five games of the season (a stretch that included losses to Chattanooga and North Florida), but hit the ground running upon his return. He’s reached double figures in every game and is shooting 42% from long distance. He’s an elite shooter off the catch and the majority of his offense comes in spot-up situations, off of screens on in transition rather than in ball screen or isolation situations. Michigan fans will remember the name Jalen Coleman-Lands after following him as a recruit out of La Lumiere in Indiana. Coleman-Lands is fairly one-dimensional as a freshman, but he does what he does well. Coleman-Lands is shooting 44% on threes and 80% of his shot attempts originate beyond the arc. Beyond that, there’s not a lot more to his game. He’s shooting just 33% on twos and has almost twice as many turnovers as assists this season. La Salle transfer Khalid Lewis will reportedly miss today’s game with the mumps. He’s a plus-passer, but struggles to create his own offense (37% on twos, 30% on threes) and avoid turnovers (22.5% turnover rate). Jaylon Tate recently replaced Lewis in the starting lineup and should see the bulk of the minutes at the point guard spot in his stead. Tate is not a three-point shooting threat (2-of-37 career) and he turns the ball over on 30.7% of his offensive possessions. Big man Mike Thorne went down to injury at the end of November and the Illini transformed from a post-up team to a pick-and-pop team as freshman Michael Finke stepped into the rotation. Finke isn’t going to beat you with his back to the basket, but he’s far more dynamic in the ball screen game either rolling to the hoop or popping to the perimeter as he can finish (66% on twos) and step out (44% on threes). Since Thorne’s injury, Finke is averaging 14 points per game and has started the last five. Finke could prove a difficult matchup for some of Michigan’s more traditional bigs and could draw Moritz Wagner into some extended action to combat the stretch five. Finke is backed up by Maverick Morgan, a more traditional big man who will still get a few touches in the post, but lacks the perimeter pick-and-pop threat that Finke has demonstrated. Push the pace: Michigan has a very good transition offense when it pushes the pace, scoring 1.31 points per transition possession, and Illinois has a horrendous transition defense. The Illini have given up 1.22 points per transition possession — good for the 1st percentile nationally. Michigan won’t get many chances to run off of Illinois turnovers, but the Illini’s lack of aggression on the offensive glass could lead to plenty of rip-and-run fastbreaks for Michigan’s guards. Attack off the bounce: This game sets up very well for Caris LeVert and other U-M players to to attack off the bounce. Illinois’ ball screen defense isn’t great and its isolation defense is worse. The Illini grade out near the bottom of the country in isolation defense, allowing 1.20 points per isolation drive (including pass-outs), and in the 30th percentile in pick-and-roll defense (including passes). LeVert is one of the best ISO players in the country and Michigan’s offense grades out in the 99th percentile in ISO offense and the 95th percentile in pick-and-roll offense. Defensive improvement? Michigan has held one major conference team below a point per possession this season (NC State) and this will be its first test in a while against a competent offense. Illinois has a reputable offense featuring one of the best offensive duos in the league, but if non-conference play is to judge this is still only the eighth best offense in the league. This is a pass-able test for the Wolverines and should be a proper barometer of how far they’ve come. Ken Pomeroy’s tireless computers project a 74-71 Michigan victory in a 66 possession contest. Pomeroy gives Michigan a 61% chance of picking up the road win, its third-best chance at a road victory this season. The situation is eerily similar to the 2013-14 season where it is critical that Michigan starts league play on the right foot. A game at Illinois isn’t easy, but it is winnable and its a chance that Michigan will regret later if it fails to escape with a road win.